"She's hardly a person anymore." New Zealand-born Jane Campion has long been a celebrated writer/director. Her early shorts took honors from the Australian Film Institute and at Cannes. She became the first woman to ever win the prestigious Palme d'Or for her 1993 film The Piano, which also earned an Oscar� for best screenplay, and nominations for best film and best director. Among her other work are the adaptation of Henry James' Portrait of a Lady, and the Janet Frame autobiography, An Angel at My Table. Based on a story by Helen Garner, who also wrote the screenplay, Two Friends was Campion's first feature-length production, made for the Australian Broadcasting Corporation, which also took best director and best TV film awards from the AFI.When we first meet Louise (Emma Coles) and Kelly (Kris Bidenko), it is hard to imagine what the two could have in common. Louise's parents have just returned from the funeral of another young girl who died of an overdose, and they have some concern for their own daughter. Both children of broken homes, Louise is studious and reserved, neat in her school uniform, a sharp contrast to the punked out Kelly. There has been a falling out between the pair, and a male school chum brings word of Kelly's current life, squatting with a boyfriend, four years her senior, at one of New Zealand's famous beach fronts. The story unfolds in a regressive fashion, playing out events, then moving back in time to reveal how they evolved. The relationship between the girls deconstructs over time, as the influences of their parents and ideologies begin to separate them. As the film progresses, the two become more and more alike, sharing the same dreams, all the more disturbing as we glimpse the subtleties that will eventually pull them apart. The audacious construction of the film makes it quite interesting, but Campion also chooses to limit the editing, instead relying more on wide shots and long takes to tell the story, allowing the audience to choose their own focus for each sequence. As with all of Campion's work, action takes a back seat to the emotional subtext of her characters, and much is left to infer as we see the lives of the young women. The color palette is muted, and the locations are working class. The heartrending story of Two Friends presents a portrait of female adolescence, where the onrush of adulthood can undermine the bonds that seem unbreakable in youth. Image Transfer Review: Two Friends was shot on 16mm, so the image has a fair amount of natural film grain. The suppressed color palette is represented well, with solid blacks and good contrast. Print defects are minor, limited to dust and light debris, and there is little sign of edge enhancement. Audio Transfer Review: Mono audio is presented well, but does reflect the low budget. There is some unevenness in levels in the source recording, making the location dialogue occasionally difficult to discern. Ambient noise is present throughout, though it is not overpowering. Nothing unexpected in the way of quality. Extras Review: A collection of useful supplements is included, starting with Campion's 1984 short film, Mishaps of Seduction and Conquest, which runs 15m:13s. The film contrasts letters written by George Mallory, a member of the doomed second expedition to scale Mount Everest, and his brother Geoffrey, chronicling conquests of a different nature.An image gallery, which runs as a 45-second slide show, features photos of the cast and crew. Available to those with a DVD-ROM, a 21-page presskit for the film is included in cross-platform accessible PDF format. Biographies on the cast and crew are included, along with many behind-the-scenes stills, and comments from the director and writer on the making of the film. This is a feature I would like to see more of. 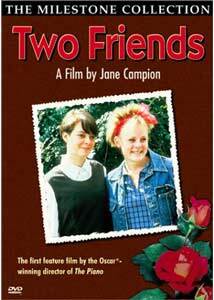 Jane Campion's first feature-length film tells the compelling tale of Two Friends parting ways. The style is unique, and the character study engaging. The disc also provides some relevant supplements, and one of Campion's early short films. A must for fans of the director, or those interested in realistic relationship dramas.